The world is all kinds of nonsensical to the point its extremely difficult for me to suspend disbelief and go along with the story. My recommendation is just skip it unless you really have nothing more interesting to read like myself. ... sigh being addicted to gool light novel is such a pain when you read most of the ones available. The novel is good, I just ignored the reviews and just read it and I liked it. Someone said it's getting out of control for a slice-of-life novel. It's not even a slice-of-life novel so wtf? People saying that she keeps using her powers when she knows it brings problems. Why would she care about using her powers if even the goddess doesn't care about what she does in that world, and nobody other than her can stop her anyways. And why are you reading an isekai novel if you don't want the MC to use their OP powers? I find it more annoying if they keep hiding it. At least she uses her powers to help people. Other people saying that the MC and the other characters are dumb, well appart from the annoying crown king from one of the first countries and the priests from the religious country, I haven't found anyone exceptionaly dumb. Besides, this world where we live is full of dumb people and nobody cares. I already read almost all raw chapters available. This is my impression of this Novel. This Novel is average value of "I said makes my abilities average" and "Evil God Average". Main Heroine of this Novel is like Misato/Adel/Mile, she re-incarnated to another world. She be-friend with this world only goddess Celestia just like Ahri be-friend with Sophia. She has no common sense of this world and everything she does is too OP make she stand out. At some point, just like Adel, she calls herself as Celestia's friend (there's no lie with that though) and was worship as a Silver Hair Loli Goddess of Micracle. She flees the country from the stalker Prince. And she is working in another country just like Adel change her name to Mile and flee to the Kingdom. At some point, she use her ability again in an Earl's party and is worship as a goddess again. The Royal family invite her to the castle and for some *spoiler* event, she swears in the goddes Celestia that she never come to the castle nor listen to the Royal again, the king can only helds his head in agony. Next, the Pope of the Church thinks she is an impostor but wants to use her, he comes to her workplace and act high and mighty and yells "You dare to defy me, don't you afraid of goddess's punishment?" She answers with "Between me, her best friend and some mortal human who dare to mis-use her name, who do you think will get the goddess's punishment?" And she use her ability that out of this world. The Pope flees for his life in fear. Next, she reveals herself to public as Goddess Celesia's best friend. She sells her potion in another world. The potion can only last 5 days to prevent country use it for war. The Holy Empire that 6 days travel from the Kingdom don't have any benefit from the potion. And their country is proud as the country of Goddess Celestia, they demand to take our heroine to their country. They waves war with the Kingdom. The whole Kingdom is worry about the war that they might lose. They give out 40.000 soldiers to the bolder to stop the Empire and only keep 15.000 soldiers to guard the capital. The Empire have 80.000 soldiders in total, they bait 40.000 soldiers at the border and 40.000 soldiers cross the mountain to invade the capital. Our Heroine finally heard the news, she understands that this war was because of her. So she casually talks with the Royal, I will stop 40.000 soldiers that try to invade the capital. *Spoiler* And then, she and her party really did it. 40.000 Empire soldiers are surrender with zero-condition when facing 15.000 Kingdom's soldiers. Next, she tells the Royal that she will defeat 40.000 Empire soldiers at the border too. The Royal family try to stop her because it's dangerous, but she doesn't care. They tell her that they won't provide horse nor food. But she just get one of the war horse from 40.000 surrender soldiers and go by herself. The Royal try to follow her only to know that they are no match for her alone. They reach the border with both soldier and horse tired to nearly death, but MC is casual like nothing. After that MC and Royal member lead all soldiers to battle. I'm pretty disappointed with this one. The story originally showed a lot of promise for the first 15 or so chapters and then quickly went downhill. Basically, I think the MC is written in such a way as to try and make her seem smart, but she fails to make rational choices and judgements in such a way as to just further the plot and make other characters see how OP she is. Surely, if she wants to live a peaceful life then why reveal her powers? When she runs away why not change her name and appearance? Why does she intentionally attract huge amounts of attention to herself by repeatedly showing off her power and then get upset when people want more of that power? Start out promising but quickly becomes really really sh*tty. At the start it was pretty standard then when the first noble tried to like capture her showed how serious it was for her to randomly use her power. All good and she learned a lesson which she proceed to not follow get found out again. Runs off to another country and get found out again and basically reveal to the world she is friend with the goddess.... All of this happen in like the first 20 chapters its like wtf? In some variation or another the author keeps insisting that the MC her is intelligent, however judging by her decisions throughout the story, she is no where as smart as she thinks she is. Though from another point of view, she has the author on her side, who basically warps reality that she is always right, so from that point of view where her claims (no matter how ridiculous they would be in reality) she is intelligent in knowing how the world works. For example, she only meets people who are... more>> just as smart as they need to be and predicts their movements, she counts on and expects them to do the "sensible" thing which she predicts, rather than them being to stupid or smart to deviate on it. From her stated goals, she takes options that seem to contradict with it, as if she finds amusement on keeping check how long she can keep it up before it blows up in her face. 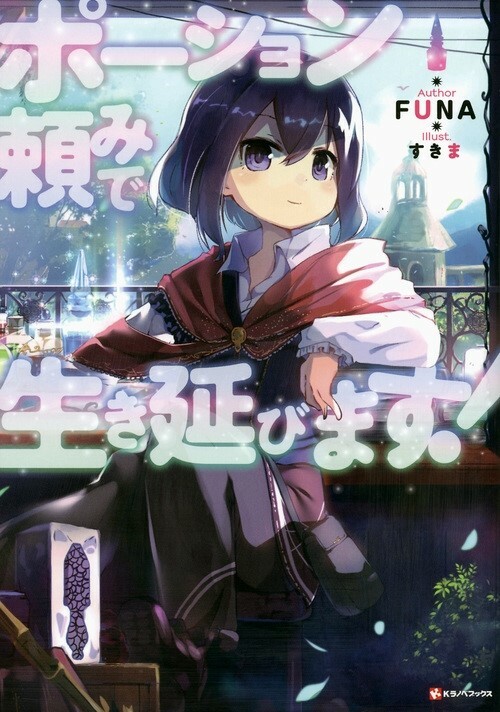 To be honest, I really like FUNA-sensei's novels. The MC is not some super-kind-heroine-idiot or maybe a 'smart' person with an exaggerated 2000 IQ. ... more>> Not some "oh boi!Since the god give me some sort of OP abilities, maybe I should pretend this is not an OP abilities and be some sort of saint-like person who collect harem!" She is also a smart 15-years-old loli who could manage to escape from a certain situation realistically! I recommend this novel and don't forget to read other FUNA-sensei's work! I'm a simple man, If I find a story about "instant karma" or where "the bad people get punished" I'll read it even if the the novel itself is an average light novel. Just like that, it's another typical Funa sensei style where you'll find "an immortal little girl MC" who often punish the bad guy who appears to bother the MC's other world life. I would have to say that this story, the 80, 000 gold, and the Healing hero one are all great concepts that have so much potential at being unique that I just had to try them. Even the synopsis sounds amazing in all 3. However, the sad truth is that every one of these stories (as well as many others) fall into the same "No idea how to make it unique so lets just make it OP MC." you find in almost every story. Sure I enjoy an OP MC just... more>> as much as the next reader, but even Average with Mile/Adel the story takes a hard left into terrain that should not have been explored in the first place making it seem like the author would rather continue with a bastardized version of the story then just write a new one. her turning into a friend of the Goddes for all to know just killed the plots and twists that may be able to develop, it was a novel suicide since obviously no one would be up against her and the excitement of the novel just evaporated. "Kaoru who was a novel enthusiast, felt like this situation was somewhat familiar." This sentence tells me that the protagonist loves to read light/web novels. Yet, for some reason she still lacks the common sense in the medieval world that so many other web novels have explored. Here's already 2 taboos that she had done by the 3rd chapter that I can name off the bat. She already assumed otherworld currency = to some fixed yen amount. I haven't seen a web novel that had NOT disproved this theory. She assumed the market price of making her first potions without checking the actual market. There's web novels here and there had people amazed at a protagonist's [lost] legendary healing potion compared to the actual potion tech at the protagonist's time. Btw, the I'm smarter-than-you advices schtick is tiresome since Funa uses it in at least 3 of her novels. Then she blames her lack of common sense that she was basing off of games that she played. What? Whatever happened to her novel knowledge? ... more>> plot 3 1/2 stars so far it is Nice but well haw to see how it develops..
Legal Loli reincarnated, and tricked the god of that world to give some awesome cheat abilities. Legal Loli. All you need to know. Pretty similar to miles from 'i said make my abilities average', in the aspects of being smart but at the same time not. It had potential, then it threw it all away. Her powers make potion creation about as exciting as consol commands in Skyrim, her personality is almost physically painful (it wouldn't be so bad if she wasn't learning impaired "I can't just use my powers in the open." *immediately uses powers in the open*), and she constantly name drops a freaking goddess. Indeed, the potion part is actually killed by how she uses it, but the thing is she took advantage of an initial deal's loopholes to get such... more>> power. Read at your own interest. Dramatically takes a nosedive into boring. OP MC. Author gives up on reasonable, sensible or normal and nosedives into absurd no-limits hot garbage. Im kind of disappointed in this. The MC is dumb. She already knows that she shouldnt expose her OP potions but there she goes going around in public and and says the she is the goddess friend. I mean she is already an adult (in soul) so she should have thought maturely. She is like a kid. The concept is interesting, the main character also interesting. Now the problem is how the author made the characters to be dumb. All the other characters were so dumb, the way MC gets her way is too dumb (except for a few occasions). Other than that, its quite relaxing and funny (other than the dumb moments).